Pierre Marcolini Confitures, made from the ripest fruit, have just 10% sugar. A NIBBLE Top Pick Of The Week. Photo by Melody Lan | THE NIBBLE. Trade up to the good stuff: Comfort food is even more comforting when it’s top quality. 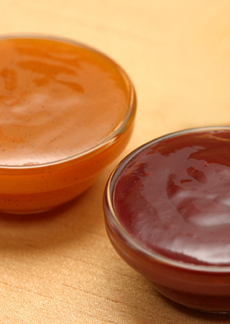 These gourmet jams, jellies, preserves and peanut butters are revelations. One taste, and you’ll never shop the supermarket stuff again. Use the Contact Us link on this page to tell us about your favorite gourmet jam or peanut butter. Flavored peanut butters are a-maz-ing. Don’t just feed ‘em when you can thrill ‘em. PBs from Peanut Butter & Company encourage you to serve halves of three different PB sandwiches, choosing flavors like The Heat Is On, The Bees’ Knees & Dark Chocolate Dreams. You can go all sweet or all savory. 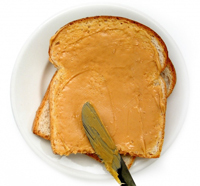 It looks like plain PB, but it’s Mighty Maple peanut butter from Peanut Butter & Co. Photo by Johanna Goodyear | IST.